The Southeast Region of Brazil (Portuguese : Região Sudeste do Brasil) is composed by the states of Espírito Santo, Minas Gerais, Rio de Janeiro and São Paulo. It is the richest region of the country, responsible for approximately 60% of the Brazilian GDP. São Paulo, Rio de Janeiro, and Minas Gerais are three richest states of Brazil, the top three Brazilian states in terms of GDP. The Southeast of Brazil also has the highest GDP per capita among all Brazilian regions. Espírito Santo is a state in southeastern Brazil. Its capital is Vitória, and its largest city is the nearby Vila Velha. With an extensive coastline, the state hosts some of the country's main ports, and its beaches are significant tourist attractions. The Southeast region leads the country in population, urban population, population density, vehicles, industries, universities, airports, ports, highways, hospitals, schools, houses and many other areas. Climate classification for Southeastern Brazil, according to the Köppen criteria. Heart of the largest continued remnant of the Brazilian Atlantic Forest, the Ribeira Valley is a Natural Heritage of Humanity, granted heritage as a Biosphere Reserve by UNESCO. One of the biggest attractions is the biologic and ecosystems diversity, where approximately 400 species of birds, amphibians, reptiles and mammals live. The Alto Ribeira Tourist State Park (PETAR) is paradise for ecotourists, for its enormous diversity in geologic formations, among grottos and caves, rivers and waterfalls. There are currently 454 caves registered by the Brazilian Society of Speleology (SBE) in the State of São Paulo, all at the Ribeira Valley. The 280 caves located at PETAR represent the biggest concentration of caves in Brazil. The Atlantic Forest is a South American forest that extends along the Atlantic coast of Brazil from Rio Grande do Norte state in the north to Rio Grande do Sul state in the south, and inland as far as Paraguay and the Misiones Province of Argentina, where the region is known as Selva Misionera. National Park of Serra da Canastra. Station Square in Belo Horizonte. The landscape of the State is marked by mountains, valleys and caverns. In the Serra do Cipó, Sete Lagoas, Cordisburgo and Lagoa Santa, the caves and waterfalls. Minas Gerais is the source of some of the biggest rivers in Brazil, most notably the São Francisco, the Paraná and to a lesser extent, the Rio Doce. The state also holds many hydroelectric power plants, including Furnas dam. Some of the highest peaks in Brazil are in the mountain ranges in the southern part of the state, such as Serra da Mantiqueira and Serra do Cervo, that mark the border between Minas and its neighbors São Paulo and Rio de Janeiro. The most notable one is the Pico da Bandeira, the third highest mountain in Brazil at 2890 m, standing on the border with Espírito Santo state. The state also has huge reserves of iron and sizeable reserves of gold and gemstones, including emerald, topaz and aquamarine mines. The state is part of the Mata Atlântica biome, and its topography comprises both mountains and plains, located between the Mantiqueira Mountains and the Atlantic Ocean. Its coast is carved by the bays of Guanabara, Sepetiba and Ilha Grande. There are prominent slopes near the ocean, featuring also diverse environments, such as restinga vegetation, bays, lagoons and tropical forests. Rio de Janeiro is the smallest state in the Southeast macroregion and one of the smallest in Brazil. It has, however, the third longest coastline in the country (second only to Bahia's and Maranhão's), extending 635 kilometers. The Mantiqueira Mountains are a mountain range in Southeastern Brazil, with parts in the states of São Paulo, Minas Gerais and Rio de Janeiro. It rises abruptly from the northwestern bank of the Paraíba do Sul River and extends northeastward for approximately 320 km (200 mi), reaching a height of 2,798 m (9,180 ft) at Pedra da Mina. The mountains, which eventually merge with the Serra do Espinhaço, were originally forest-covered, except for the peaks that rise above the tree line. They provide charcoal and pasture for cattle; on the lower slopes there are several health and tourist resorts, such as Campos do Jordão, Brazil's highest city. The name Mantiqueira derives from a Tupi word meaning "mountains that cry", denoting the large number of springs and streams found there. Guanabara Bay is an oceanic bay located in Southeast Brazil in the state of Rio de Janeiro. On its western shore lies the city of Rio de Janeiro and Duque de Caxias, and on its eastern shore the cities of Niterói and São Gonçalo. Four other municipalities surround the bay's shores. Guanabara Bay is the second largest bay in area in Brazil, at 412 square kilometres (159 sq mi), with a perimeter of 143 kilometres (89 mi). Espirito Santos's beaches in Guarapari. With 46.180 square kilometers, it is about the size of Estonia, or half the size of Portugal, and has a variety of habitats including coastal plains, lakes, mountain forest, mangroves and many others. The main river in the state is the Doce. Other important river basins include the Santa Maria River Basin which is the northern branch of rivers which join the sea at Vitoria, and Jucu River Basin which flows into the sea at roughly the same place, but corresponds to the southern branch (which seems to come out of Vitoria). Espírito Santo's climate is tropical along the coast, with dry winters and rainy summers. North of Doce River it's generally drier and also hot. In the mountainous regions in the south and south west of the state, the tropical climate is strongly influenced by altitude, and the average temperatures are colder. The state can be divided into two areas: the low lying coastline and the highland area known as Serra (where one can find the 2.890 m Pico da Bandeira mountain), which is part of the larger Serra do Caparaó, the Caparaó Mountain Range. In the map to the right it is in the gray area in the extreme southwest of the state, and is shared with Minas Gerais. The Doce River is a river in southeast Brazil with a length of 853 kilometres (530 mi). The river basin is economically important. In 2015 the collapse of a dam released highly contaminated water from mining into the river causing an ecological disaster. São Paulo state is responsible for approximately one-third of Brazilian GDP. 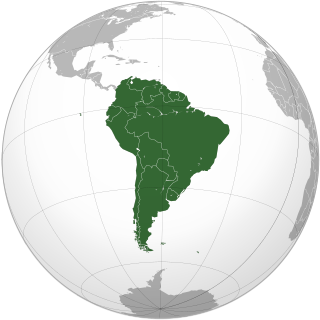 The state's GDP (PPP) consists of 550 billion dollars, making it also the second biggest economy of South America after Brazil and the biggest subdivision economy in Latin America. Its economy is based on machinery, the automobile and aviation industries, services, financial companies, commerce, textiles, orange growing, sugar cane and coffee production. Minas Gerais is a growing state. 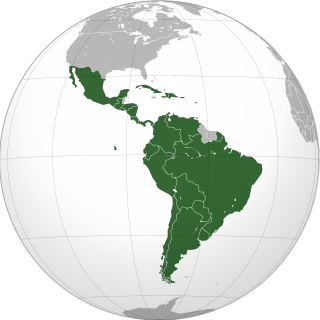 Latin America is a group of countries and dependencies in the Western Hemisphere where Romance languages such as Spanish, Portuguese, and French are predominantly spoken; it is broader than the terms Ibero-America or Hispanic America. 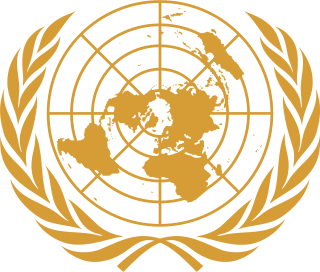 The term "Latin America" was first used in an 1856 conference with the title "Initiative of the America. Idea for a Federal Congress of the Republics", by the Chilean politician Francisco Bilbao. The term was used by Napoleon III's French government in the 1860s as Amérique latine to consider French-speaking territories in the Americas, along with the larger group of countries where Spanish and Portuguese languages prevailed, including the Spanish-speaking portions of the United States Today, areas of Canada and the United States where Spanish, Portuguese and French are predominant are typically not included in definitions of Latin America. Vehicles: 36,030,943 (Jan/2012);  Telephones: 23,878,000 (April/2007); Cities: 1,668 (2007). Portuguese is the official national language, and thus the primary language taught in schools. English and Spanish are also part of the official high school curriculum. French is also widely studied. São Paulo-Guarulhos International Airport (GRU). São Paulo-Guarulhos International Airport connects Brazil to 28 countries and is visited every day by nearly 100 thousand people. With capacity to serve 15 million passengers a year, in two terminals, the airport currently handles 12 million users. Construction of a third passenger terminal is pending, to raise yearly capacity to 29 million passengers. The project, in the tendering phase, is part of the airport's master plan and will get under way shortly. São Paulo International Airport is also one of the main air cargo hubs in Brazil. The roughly 100 flights a day carry everything from fruits grown in the São Francisco Valley to the most sophisticated medications created by science. The airport's cargo terminal is South America's largest and stands behind only Mexico City's in all of Latin America. In 2003, over 75 thousand metric tons of freight passed through the terminal. The Confins International Airport in the main hub in Minas Gerais. Tancredo Neves/Confins International Airport is located in the municipalities of Lagoa Santa and Confins, 38 km from Belo Horizonte, and was opened in January 1984. It was planned from the start for future expansion in steps to meet growing demand. The first step was undertaken with careful concern for the environment, including monitoring by specialized consultants, since the region has a rich archeological heritage. The airport's location is attested to by the fact it has one of the lowest rates of shutdown for bad weather in the country. Confins is certified by the ISO 9001 standard, covering ten processes in the administrative, operational, safety/security and maintenance areas. Starting in March 2005, Confins Airport will receive flights that currently use Pampulha Airport. Vitoria Airport is located on a land plot of just over 5.2 million square meters. Since construction of its first step, finished in 1946, Vitória Airport has undergone several expansions and modernizations, but current demand has surpassed its capacity of 560 thousand passengers a year. The recent construction of new aircraft parking boxes on the aprons has improved the airport's operational efficiency. In 2003 more than 1.2 million passengers used the airport, and in 2004 this rose to some 1.25 million. Vitória is one of the 32 airports in the Infraero network that has a cargo terminal. In May 1999 the first direct international freight connection to the United States (Miami) began operating to Vitória, facilitating imports to the state of Espírito Santo. Today there are five of such flights a week. Dom Pedro Highway, part of Campinas Beltway. Photo by Renato M.E. Sabbatini. The Southeast Brazilian region is highly covered by Paved roads – due to the policy in the Brazil's economy in the 1960s (automobilization of the country) – which led to the car's manufacturing to be a major industry not only in the region but in Brazil as well. The Southeast's highways are generally in good or very good conditions – some exceptions are made to the southern parts of the BR-101. Railways are present as well (and also, the region is more covered than any other region), but mainly for freight transport – soil and iron, mainly, from the farms and mines to the seaports. Also, a very complicated hydrocanal system is present in the region, with ten major dams. 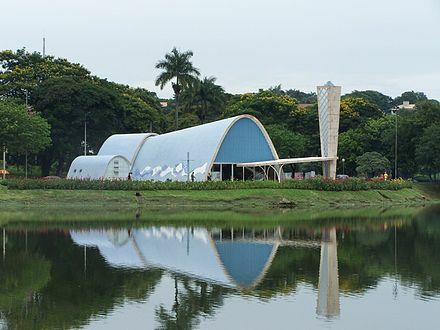 The Pampulha Church in Belo Horizonte is one of the most expressive symbols of the Brazilian Modern Architecture. São Paulo is the largest Brazilian city. Health care and education are of major concern in the larger cities, but in smaller ones, the population are generally well-looked after. Minas Gerais is a state in the north of Southeastern Brazil. It ranks as the second most populous, the third by gross domestic product (GDP), and the fourth largest by area in the country. The state's capital and largest city, Belo Horizonte, is a major urban and finance center in Latin America, and the sixth largest municipality in Brazil, after the cities of São Paulo, Rio de Janeiro, Salvador, Brasilia and Fortaleza, but its metropolitan area is the third largest in Brazil with just over 5,500,000 inhabitants, after those of São Paulo and Rio de Janeiro. 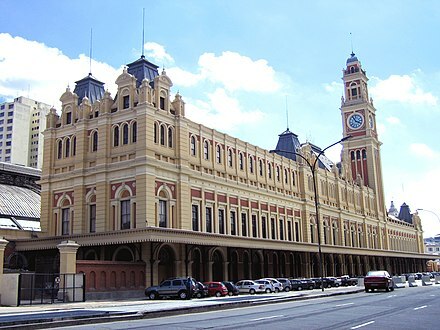 Nine Brazilian presidents were born in Minas Gerais, the most of any state. Manhuaçu is a municipality in Eastern Minas Gerais state, in Brazil. Its population was 86,844 (2015) and its area is 628 km². Vitória, spelled Victória until the 1940s, is the capital of the state of Espírito Santo, Brazil. It is located on a small island within a bay where a number of rivers meet the sea. It was founded in 1551. The city proper 93 square kilometres has a population of 358,875 (2015) whilst the Greater Vitória metropolitan area has a population of more than 1,857,616 (2013), the 14th largest in Brazil. Baixo Guandu is a municipality located in the Brazilian state of Espírito Santo that was founded on April 10, 1935 and established as a city on June 8, same year. The city's celebration day is April 10. Its population was 29,891 (2009) and its area is 918 km². The area is most well known for its exports of coffee, especially from the high mountains of the district of Alto Mutum Preto. The main watercourse through the municipality is the Rio Doce river whose basin is composed of 222 municipalities. Empresa Brasileira de Infraestrutura Aeroportuária, Infraero in short, is a Brazilian government corporation founded in 1973, authorized by Law 5,862, being responsible for operating the main Brazilian commercial airports. In 2011 Infraero's airports carried 179,482,228 passengers and 1,464,484 tons of cargo and operated 2,893,631 take-offs and landings. It manages 63 airports, which represent 97% of the regular air carriage activity in Brazil, 81 Air Navigation Stations and 32 Cargo Logistics Terminals. Vriesea is a genus of the botanical family Bromeliaceae, subfamily Tillandsioideae. The genus name is for Willem Hendrik de Vriese, Dutch botanist, physician (1806–1862). Its species are widespread over Mexico, Central America, South America and the West Indies. The Tietê Bus Terminal is the largest bus terminal in Latin America, and the second largest in the world, after the Port Authority Bus Terminal in New York City. The terminal is located in the Santana district in the city of São Paulo, Brazil. The official name in Portuguese is Terminal Rodoviário Governador Carvalho Pinto, named after Carlos Alberto Alves de Carvalho Pinto, a former Governor of the State of São Paulo. The State of Brazil was one of the states of the Portuguese Empire, in the Americas during the period of Colonial Brazil. 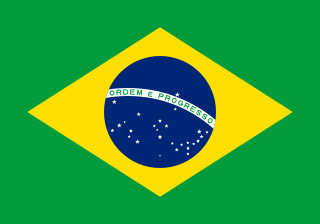 The Brazilian municipal elections of 2012 took place on October 7 and on October 28. Over 138 million voters chose mayors, deputy mayors and city councillors for the 5,568 municipalities of Brazil. These were the first elections in which the recently registered parties Partido Pátria Livre (PPL) and Partido Social Democrático (PSD) participated; they were both recognized by the Supreme Electoral Court in 2011. Political parties whose candidates wished to run for the 2012 elections had to be registered at the TSE for at least one year before the election date, while candidates also had to be affiliated to a party for the same period of time. Conventions for the selection of candidates within the parties occurred between 10 and 30 June, while the registry of candidates and alliances with the Regional Electoral Courts took place until July 5. Electoral campaign was authorized from the moment a candidacy had been registered. The free electoral program – two daily slots on free-to-air TV and radio for political advertising paid by the Electoral Justice fund – ran weekdays from 21 August until 4 October. According to the current Brazilian electoral law, the two-round system – should the leading candidate receive less than 50% +1 of the votes – is only available for cities with more than 200,000 voters. This includes all state capitals, with the exception of Boa Vista, Roraima and Palmas, Tocantins, plus 59 other municipalities. The free electoral program for the second round ran from 13 October until 26 October. The Miss Brasil 2013 was the 59th edition of the Miss Brasil pageant, was held in Belo Horizonte on September 28, 2013. The winner was Jakelyne Oliveira who has represented your home country in the 2013 Miss Universe pageant. Twenty six delegates from each state and the Federal District competed for the crown. Current titleholder, Gabriela Markus of Rio Grande do Sul, crowned her successor at the end of the event. The Mantiqueira Mosaic is a protected area mosaic that contains conservation units in the states of Rio de Janeiro, São Paulo and Minas Gerais, Brazil. The conservation units are of different types and are managed at the federal, state or municipal level. The mosaic provides a level of integrated and coordinated management. ↑ "2010 IBGE Census" (PDF) (in Portuguese). IBGE.gov.br. 2010. Retrieved 3 April 2012. ↑ "SIDRA IBGE - Table 3175 - Resident population by color or race" (in Portuguese). 2010. Retrieved April 25, 2012. ↑ "January 2012 Fleet - Denatran" (in Portuguese). Denatran.gov.br. Archived from the original (zip) on 1 August 2012. Retrieved 11 April 2012.